•We UCGOU is the professional manufacturer specializing in producing all sorts of poly mailers and bubble mailers. Sustainable innovation is our unremitting pursuit. Having advanced technology and equipment, we are dedicated to offering packaging and shipping solutions to our customers with competitive price, excellent products and service. •UCGOU poly envelopes are made of heavy duty 100% virgin plastic, which have a good stretch, lightweight and water and tear resistant, not the cheap ones that have glue everywhere. The bag is light enough, not to add too much to weight in first class packages but thick enough to feel that your products are safe when inside. However, the most important is the poly mailers are only suitable for non-frigle items or soft ones like clothes. •Tape, wrapping film and corrugated cardboard box......This is too much trouble when you prepare to ship somethings. It's time to say bye to the troublesome!! •Come to UCGOU! Send your package in clean, simple but grand style which would help to upgrade your company professional image. Believe us. High-efficiency mailers with designer pattern will allow customers to easily identify their orders from your shop when they arrive in their mail. EYE CATCHING. 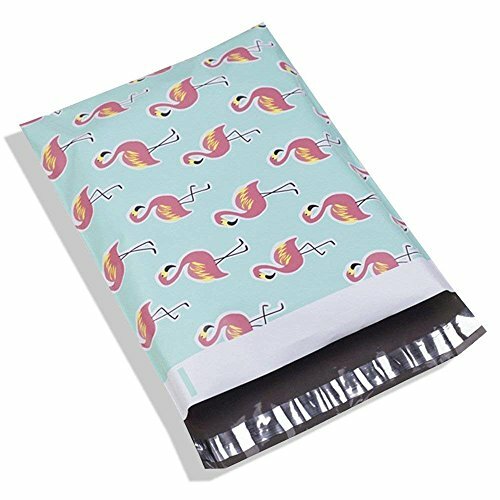 Mint green outer surface poly film with pink flamingo across the front and back. This unique design helps the customer bags to stand out and your dear friends find them easily. PREMIUM QUALITY ENVELOPES have a good stretch, lightweight and water-resistant. Lower the shipping cost of your business and protect your products on the rainy or snowy day. TEAR RESISTANCE SELF SEALING ENVELOPES. The adhesive on the fold-over flap is really strong and tamper-evident. There's no need reinforcement tape and it doesn't come apart unless you tear it up. ONLY FOR NON-FRAGILE ITEMS. The shipping envelopes are perfect for sending clothes and shoes. If you are shipping anything which is breakable, we would recommend UCGOU bubble envelopes. If you are tired of plain regular mailers, our DESIGNER POLY MAILERS are a choice for you. 100% Satisfaction Guaranteed. If there are any quality problems, just let us know for a refund or replacement. View More In Packaging & Shipping Supplies. If you have any questions about this product by UCGOU, contact us by completing and submitting the form below. If you are looking for a specif part number, please include it with your message.